Over the past decade we have witnessed first-hand the rise in demand for content and its’ role as a catalyst for sustained growth in SEO. When content is carefully planned, optimized, and executed, brands benefit from a steady stream of organic traffic and leads from Google for years to come. Content creation is essential to SEO success, but often represents the biggest hurdle for businesses to scale. So, it’s important to consider the following question going into 2019: Is your content working for you, or is it the other way around? First, most marketing teams lack the internal resources to execute a content strategy. In many cases, teams are already overloaded with social media, website, and PR content, and do not have the bandwidth to support SEO objectives. Second, many brands overpay for specific, platform-based content to such a degree that it becomes fiscally impossible to justify further investment in simple, proven SEO content initiatives that need to be replicable and scalable. Lastly, in the event that a content strategy is effectively coordinated amongst marketing, social and PR teams, it often does not occur in coordination with SEO. Businesses that blog consistently receive a staggering 55% more website traffic and over 80% more leads (Hubspot). Does your website have a blog? If any of these scenarios are familiar challenges or represent your current situation, Alphametic offers a solution. Our in-house “SEO content studio” is designed to offer our clients a wider portfolio of problem-solving initiatives to close this SEO content performance gap. Our content studio team is comprised of an SEO content strategist supported by digital copywriting talent and an SEO analyst. Our main motivation is to be in the driver’s seat of our clients’ SEO success to control their outcomes — from research, analysis and planning, all the way through to execution. An important distinction is that we are not branding your content, or aiming to replace any of your current creative content sourcing. Our method of content strategy and execution is different. It’s based on proven clinical search engine mining that addresses client demand for “incremental and continuous” SEO content creation based on our performance gap analysis. Over 60% of marketers create at least one piece of content each day. Why? Long-form content ranks significantly higher in Google’s search results than short-form content. The average word count of a Google first page result is 1,890 (Backlinko study). How? One of the Alphametic’s top-performing clients implemented the recommended long-form guides, SEO blogging techniques, and keyword-targeted landing pages and experienced a 246% search traffic and visibility growth year-over-year. Why? Because businesses that blog consistently receive a staggering 55% more website traffic and over 80% more leads (HubSpot study). How? Another top-performing Alphametic client experienced over 172% growth in blog traffic year-over-year from an SEO optimized, consistent stream of blog posts and how-to articles. Compelling copy draws 7.8 times more site traffic and produces brand recall, which brings higher engagement rates. Why does my business need professional copywriting services? Digital copywriting, as it is done today, consists of writing in a way that is SEO-friendly, while also being persuasive and leading to conversions. Professional copywriters don’t just write nice words, they use tried and tested best practices and take the time to learn how your customers speak and communicate. Most businesses don’t have the time to create long-form website copy themselves or the expertise, so hiring a copywriter becomes a necessity. 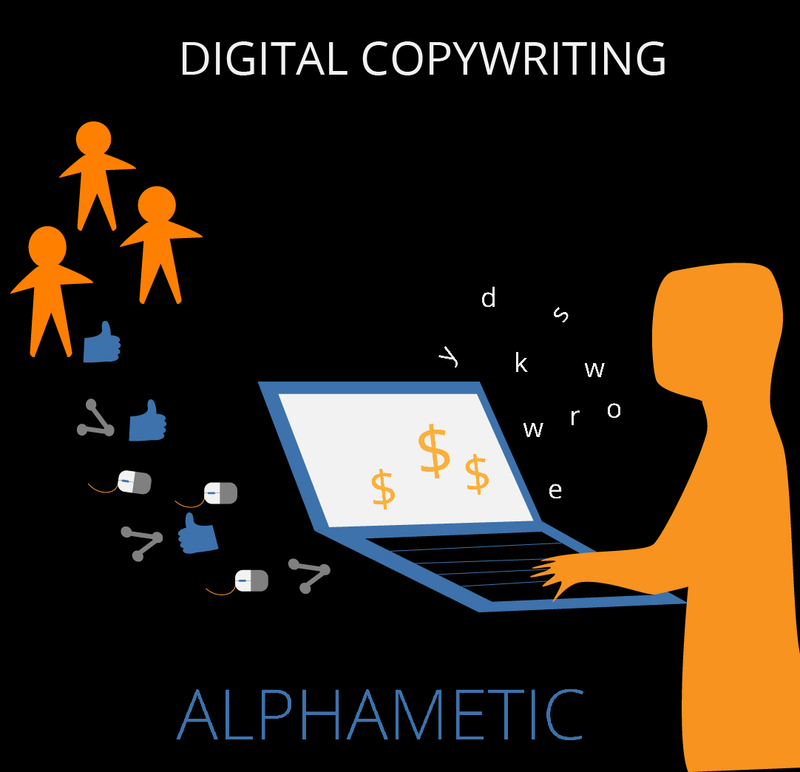 Check out some of the writing tools and apps our copywriter uses at Alphametic. What’s the difference between a copywriter and a content writer? These two industry terms generally overlap in many areas. A content writer and digital copywriter can both produce items meant to be consumed online, like landing pages, eBooks, blog posts, etc…In general, copywriters encapsulate more expertise on branding and persuasive writing where conciseness is key, whereas content writers tend to produce more researched-based articles for blogs and web pages. Copywriters are also recognized as producing copy for print ads and other more traditional forms of marketing. What copywriting services do you provide? We offer an array of online copy services such as SEO-driven copywriting for web pages, blog posts, whitepapers, landing pages, long-form how-to guides, and more. Once your content strategy and keyword mapping are in place, we work with you and to determine what type of content fits your needs best and execute. How much do you charge for your copywriting services? It depends on many factors, like the size of your business, the type of content and other determinants. Reach out to us here for a quote on our digital copywriting services pricing and costs. What comes first, design or copy? Does the chicken come before the egg? If you already have a creative layout ready for copy, we can adjust the copy to the design. We also take part in the ideation of the content’s layout if no design has been made. You sound like a good fit for my copywriting project. What’s the next step? Let’s chat! Reach out to use here and we can discuss your needs further.